Prop 8 is history; the Supreme Court effectively upheld the lower courts ruling that said it was unconstitutional. Moreover, they told the moralfags that they had no standing to argue the case. The Supreme Court also gutted DOMA, the poorly named "Defense of Marriage Act" and said the federal government has no business denying benefits to married couples, regardless of their hetero or homo nature. 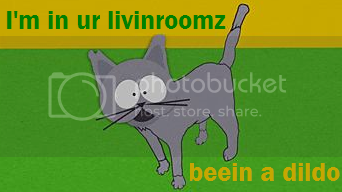 States still don't have to recognize each other's gay marriages yet, but that won't be far off methinks. One more barrier of discrimination is coming to an end in the United States of America. Marriage equality is officially the law of the land in California, Washington, Minnesota, Iowa, Maryland, New York and all of New England (roughly 40% of the population). Expect more states to join this club of fairness in the next couple years. Congratulations, homosexuals! And congratulations, America! I don't understand why so many people are fighting for the right to ask the government for permission to get married. True equality is not asking the governments permission to be with the one you love. Married people get a lot of benefits for their partners that unmarried people can't get. This is why gay people really want to get married. Love is not enough. Well congratulations to the Ladies and Gentlemen who prefer their own same-similar kind. Best tweet I saw about this all day was "BRB, getting gay married in a Chick-fil-a because I'm willing to compromise my sexuality for a punchline." 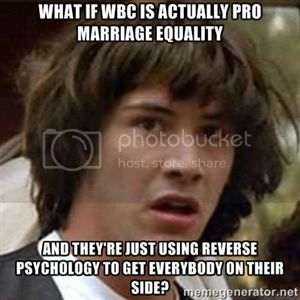 Thanks, SCOTUS, for making the WBC lose its mind. Mrs._Eff wrote: I can't believe this even needs to be taken to the supreme court. Supreme Court sent it back to California. My state of Wisconsin is probably years away from getting with the program on marriage equality. Republican weasels got voters to 'ban' it in '04 and then they gerrymandered themselves into a legislative majority more recently. So the first state to elect an openly gay senator isn't going to be equalizing marriage legislatively before 2022. Anyone got the number for one of those "activist judges"?